You probably already know that quinoa is a superfood packed with protein, fibre and other nutrients, but have you ever tried to include it in your breakfast? 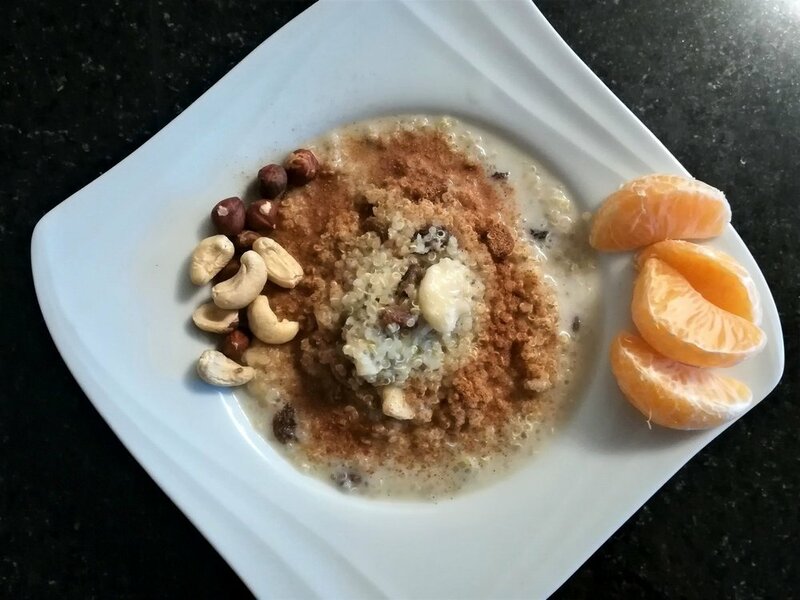 This is a simple, warm breakfast quinoa bowl that is as balanced and nutritious as any breakfast can get. Aside from plenty of protein and fibre it will also provide you with a good amount of B vitamins, magnesium, potassium, Omega 3 and antioxidants, for a superb start of your day. Preparation time: 15 min if cooked from scratch. Alternatively you can also cook quinoa in a batch the previous evening, which will cut down your morning cooking time to about 5 min. Transfer quinoa and almond milk into in a mid-sized cooking pot and bring the mix to boil. Add raisins and gently simmer for 10 minutes. If the mix gets too dry during cooking, add more almond milk. Two minutes before the end of the cooking add in sliced bananas, nuts and cinnamon. Once the quinoa mix is cooked, remove it from the stove and cool it down to an edible temperature. Mix in grated apples and serve warm.